Put together a Valentines confection at Alpacas at Marquam Hill Ranch yesterday. Scarf confection… A bouquet scarf for Valentine’s Day. Jennifer and Bill allowed me to sell my scarves at their store at Apacas at Markham Hill Ranch. I laid out a pretty bouquet scarf as a demonstration at Alpacas at Marquam Hill Ranch today. I was hoping to sell a few scarves but that didn’t happen. I did sell one small scarf though and generated some interest in the felting class we will be holding there next month. 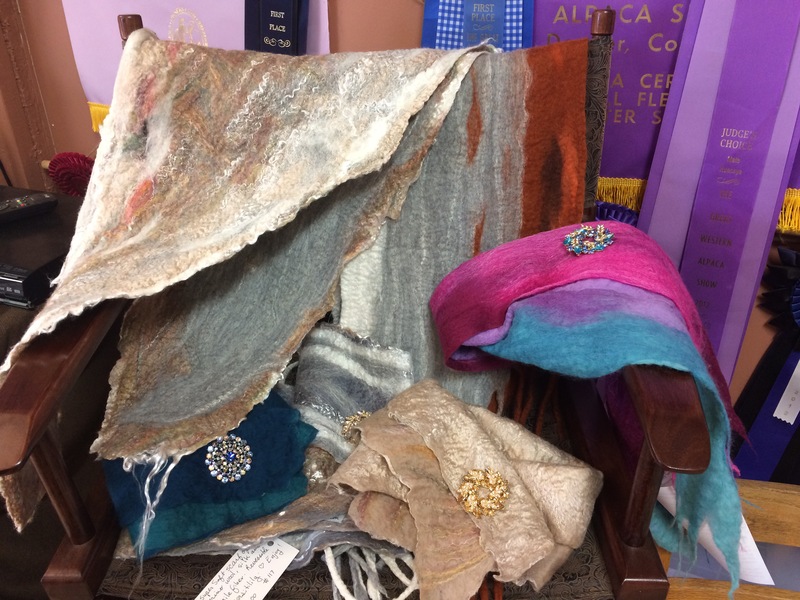 Upcoming : Wet felting workshop – you will make, and take home, a beautiful and textured scarf of fine merino wool and silk. Place: 1717 Sonya Dr. SE Salem, Oregon. I will consider other dates if these do not work for interested participants. Since the workshop is in my home, I am able to accommodate 4 workshop participants at a time, so register early to save your place, or places for a small group. I have approximately 100 merino wool and merino/silk blend colors waiting to be made into gorgeous, soft, artistic scarves. I also have some yak/silk/merino blends, baby camel/silk blend, pure silk fiber, and tensile fiber, for extra soft and shiny accents. I provide all the tools and tables to accommodate each participants needs. You will learn basic wet felting techniques and how to place colors to get desired results. You will make, and take home with you, a two sided scarf with a center core for strength and durability, of your own color choices. There is no knitting or crocheting involved in this technique! The cost is $85, or $75 when registered at least one week in advance. Participants must be age 13 or older; however, if desired, a parent and child under 14, can register together as one participant and make one scarf together. I must have at least one participant registered at least 24 hours in advance, as I rearrange my home to run a workshop. To register, please email or text me of your interest, or leave your contact information here indicating which workshop you would like to attend. My phone and text # is 407-766-2588. I sometimes do not answer the phone so please leave a message with your information, and I will return your call. Please leave your name, phone number, and email address; as well as which workshop you would like to attend, or if you have a different date you would like to suggest for a workshop. Once your registration is confirmed and your place is saved, please mail the workshop fee of $75 to 1717 Sonya Dr. SE Salem, Oregon 97317. On Dec. 8, we had a workshop with Eileen and MaryJo. MaryJo chose red merino and silk 50/50 blend, which, when dry, will be super soft and have gorgeous texture. I wish I could have taken a photo when the red wrap was dry, but that usually takes overnight, and my workshops don’t last that long! Unless we did a sleepover . . . Hmm, that would be fun too! Eileen created a long narrow scarf for herself, using the woodland colors merino and silk blend along with mocha and cyan merino wool accents. You can see the gorgeous colors and shine even when wet, but again, I wish I could show photos of this scarf when dry, the fibers fluff up into beautiful textures and brighter colors! The workshop lasted less time that I expected. We didn’t get started on time due to the weather and being not sure if the workshop would even be held, but they made it to my house at about noon or so, and we worked until a little after four. They were fast putting their fibers down in the shape they chose, and the fiber felted easily. They left before dark, which was good considering the weather was still icy. My sister Cheryl jumped in an hour or so after class started, and created something as well. She was so funny because she has felted before and she just went to town doing her own thing. I had been working on a pattern for a certain look I wanted to achieve in a future wrap/scarf I want to make, and when I finished the pattern late last night, I saw that she used the shape of my pattern without even seeing it! Ha ha! As she worked, she appeared to be just throwing her fibers on willy nilly, but in the end everyone could see she knew exactly what she was doing. You can see by the outcome . . . Beautiful. 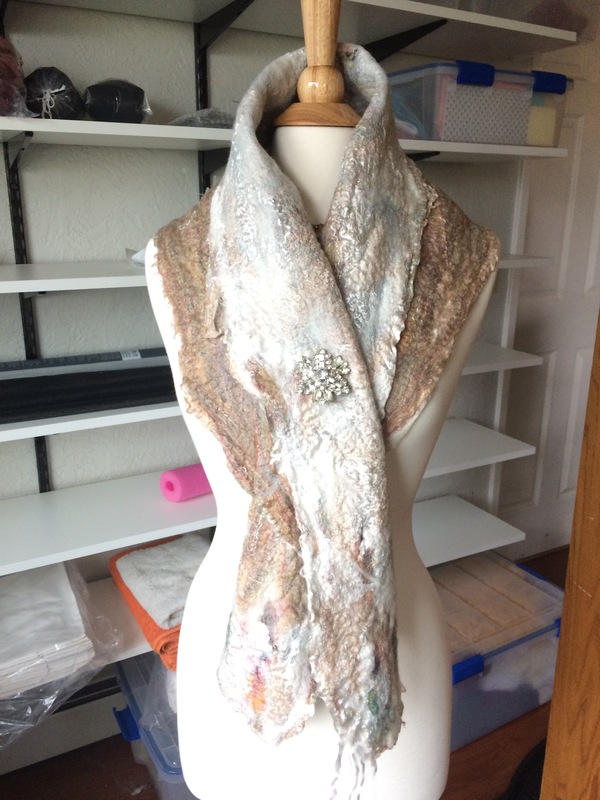 I was able to take a photo of her project today, with the shawl she created all dry and arranged on the mannequin. The colors and textures pop more when dry than when wet so the finished product is easier to appreciate. I’m having a difficult time posting the photo of her scarf so I will post it later, below. For upcoming workshops please click HERE. The shape Cheryl used was like a typical shawl, but when turned upside down, and a collar turned on it, the shawl becomes more like the wrap pattern I was making. This design she created is also reversible and reposition able in many different ways for many different looks!